Chewang Norphel, Retired Engineer: Due to global warming and less snowfall in winters, the natural glaciers of Himalayas are shrinking and we are facing an acute shortage of water in Ladakh. The natural glaciers are receding every year and we can see the snow only at the top of the mountain. If we look back over the past 30-40 years or so, we used to get heavy snowfall, whole Ladakh used to be covered in a white sheet of snow for almost three months in winters. In winters, the average snowfall measures two or three feet. There was no shortage of water at all and the stream was mostly overflowed. Ladakh can face the problem of water shortage if we don’t take the measures now. It is the right time to think about a systematic plan for usages, conservation of what we have. If we avoid this issue, then we are going to face an immense shortage of water. Today, people are busy making easy money because of the introduction of tourism and army in the region. People are converting agricultural land into buildings and guesthouses. There is a shortage of water but people are not realizing it. People extract groundwater from bore wells and hand-pumps. But the question is, ‘Is tourism and army sustainable? There is a need to look for a long-term solution keeping the sustainability of Ladakh. If we continue to ignore this issue, the day is not far when the groundwater will also dry. Artificial glacier: It is a simple, cost-effective technique for harnessing and conserving the water which flows freely in winters. The artificial glacier has to be built near the stream with stone embankments at regular intervals, these stoppages impede the flow of water and forming shallow pools. The pool freezes in the winter accumulating ice, thus forming the artificial glacier. The natural glaciers water melts only in mid-June but the farmer needs water in April and May. So this proves the easiest way to solve the shortage of water in the sowing season. The artificial glaciers are built at the height of the village so that the melted water from it can be easily used at the most crucial time. In artificial glacier, since we store the water in the embankment, much of the water seeps down helping in recharging the underground water. If the underground water is recharged well, it will help to produce more water into the streams. Percolation tank: It is also one of the methods through which we can store water to percolate into the ground. In this method the water is stored in a pool which further runs to the next pool and the leaked water from the first pool will be stored in the last pool thereby conserving every drop of it. The more we store the water, the more it will help to recharge the groundwater. In order to bring out the water through bore wells and hand-pumps, the level of groundwater should be appropriate. And to maintain the groundwater level, percolation tank is the best. Today, most of the household prefers to have their own bore well especially in Leh town, but no one thinks of recharging the groundwater. Installing more and more bore wells can affect the groundwater. If we take an example of the pasture land of Skara, there was a time when the land was marshy. There were few streams also but today the pasture land is all dried up. This is the result of groundwater extraction through borewells. Local pond: It is an old tradition of Ladakh to store the water locally known as ‘rZing’. The water is used to irrigate fields. This storage of water helps to maintain moisture in the soil thus resulting in a good yield of crops and trees as well. Diversion channel: South facing villages mostly face scarcity of water in the sowing season. It is because the wind direction is opposite and the snows in the mountain are carried back to the other side of the mountain. This snow and water are of no use. So the village falling in this direction can install bunds to divert the melted water into the village. It also stops the snow to be blown away, hence divert the water. A diversion channel works wonder to overcome these challenges. Spread water in the rocky land of the mountains: When the water is of no use, we can spread the water over rocky land before winter. The ice is formed on it and takes time to melt. Lifting river water: Today, we have a lot of modern technologies to lift the water. Ladakh has enough barren land which can be easily converted into cultivable land. If we take an example, Israel is the most efficient to handle water crisis by adopting innovative technologies. We should learn from the country like Israel, where despite the scarcity of water, people are producing agriculture products tremendously. Use of modern technology: To meet the shortage of water, we have modern techniques such as drip irrigation, sprinkler irrigation, gunshot irrigation, etc which can be adopted by the people. • Artificial glacier, percolation tank, diversion channels, Dam and other methods should be adopted according to the needs of villages. • Groundwater recharge is very important. We need to urgently revive the traditional ‘rZing’ systems that act as groundwater recharging mechanism. • With the availability of enough resources and scope in the field of agriculture, people should adopt modern technologies and techniques. • Agriculture is sustainable and people should carry forward the tradition in future. • Experts from the country like Israel should be invited to interact with the farmers and the younger generation. 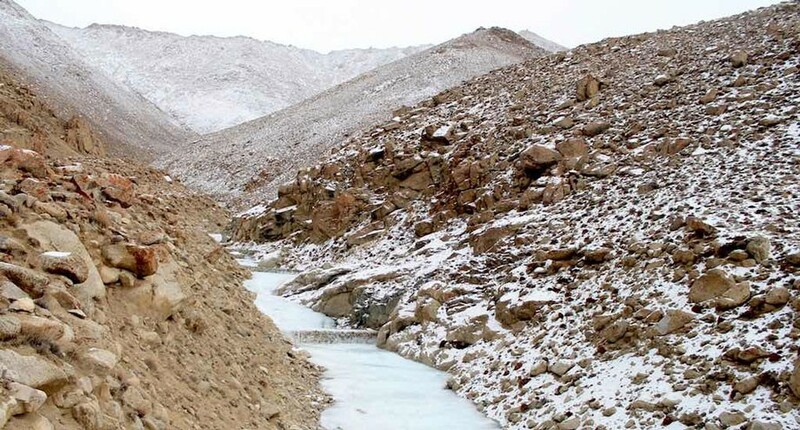 Nazir Ahmed, Project Coordinator, LNP: Ladakh is totally dependent on snowfall for water. If there is less snowfall in winter then there are chances of the scarcity of water in summer. Even we receive less rainfall in the summer season. Otherwise, we can go for rainwater harvesting. Unfortunately, our farmers are totally dependent on snowfall for water. Not only agriculture, but the tourism industry is totally dependent on glacier water. All the guesthouses and hotels use gallons of water each day. This year, we received very less snowfall, so we will face a shortage of water. If this continues, there can be a very big problem for the whole Ladakh. And gradually we have to give up everything including agriculture and hotels and guest house due to the water crisis. Last year, Leh Nutrition Project (LNP) in collaboration with Ladakh Environment and Health Organisation (LEHO) and Ladakh Ecological Development and Environmental Groups (LEDeG) conducted a survey in most of the south facing villages of Leh district funded by Tata Trust. We found that each year farmers are facing the shortage of water for agriculture purposes. Since the glacier melts in mid-June or July is left unused. While on the other hand, farmers need water in the sowing season. The glacier water reaches after the sowing season when the need for water is not that much. So to cope with it, artificial glaciers act as the best solution because being made at the top of the village, it melts exactly in the hour of need. Sowing at the right time is good for crop yield and in the right season. The water table of Leh is 120ft depth from the surface so there is no problem of scarcity. Some German researcher who had conducted a study on the groundwater of Leh said that the groundwater level is quite good in Leh. They said that the groundwater level depends on the underground glacier called ‘Permafrost’. If it melts then there can be a scarcity of underground water. As for now, the groundwater level is good but there is a need to regulate water with the increasing installation of bore wells and hand pumps. It’s always better to have plans for the groundwater recharge. Percolation tank, dam and artificial glaciers are the main solutions to overcome the crisis of water. In the past, people used to be very active and responsible to work for the society voluntarily but today, no one has time to think about society. There are no NGOs, government and individual who built the dam and percolation tank for the underground water recharge. In order to balance, steps are needed to be taken at the right time. Agriculture is getting a setback in Ladakh and the reason is not only water issue but people are more interested in making easy money from tourism and army. However, the concerned departments are not playing an active role to strengthen and uphold the practices in Ladakh. If they have a plan and policy to assist farmers in adopting the latest technology, overcoming the challenges of water and assist them in marketing, packaging and processing etc there could be more people who have been carrying out the practice of agriculture in Ladakh. • Artificial glacier is the best way to overcome the issue of water in Ladakh. • Percolation tank and dam should be made to recharge the groundwater. • Diversion channel, snow barrier bandh needs to be adopted.